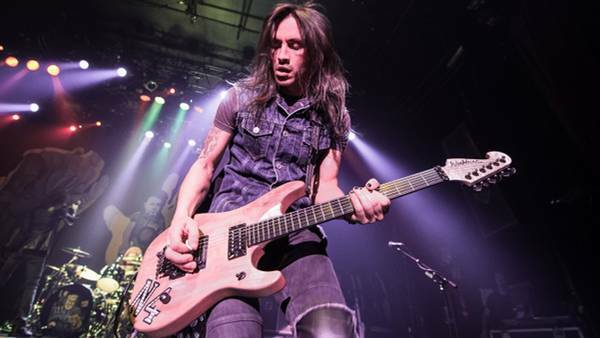 Nuno Bettencourt - Extreme's Shredder - Welcome To All That Shreds Magazine! Welcome To All That Shreds Magazine! Dedicated to the Hard Rock and Heavy Metal Guitarist And Their Respective Bands! Starting his career as the lead guitarist of the Boston funk metal band Extreme, Nuno Bettencourt is a Portuguese-born American guitarist, singer-songwriter, and record producer. His musical career rose to international prominence in 1985 after he joined the Extreme as a lead guitarist. From there he made a lot of mark on the music industry, from founding four different musical bands to designing The N-Series Guitars. Nuno Bettencourt is a Rockstar that rocks. Nuno Bettencourt was born on the 20th of September, 1966 in Praia da Vitoria, Terceira, Azores, Portugal but grew up on the Main Street in Hudson, Massachusetts. As a boy growing up, Bettencourt was more into sports than music; he spent most of his leisure time playing soccer and hockey. His interest in music started growing when he started playing drums, which is his first musical instrument. Noticing his dedication and passion for sounds, his brother, Luís started teaching him the guitar. According to him, he didn’t realize how much he loves guitar till he started playing with his brother. Nuno Bettencourt joined Extreme as a guitar player in 1985. Extreme is a Boston-area musical band, made up of four members including Bettencourt as the lead guitarist, Gary Cherone, lead vocals, Pat Badger as the bass player and has Paul Geary for drums. Shortly after Bettencourt joined the group, Extreme got signed by A&M Records, and they released their debut record in 1989. Some of Extreme’s significant hits include the acoustic ballad “More Than Words” and “Hole Hearted” from the album Pornograffitti. The two songs made #1 and #4, respectively, on the 1991 Billboard Hot 100 singles chart. Pornograffitti album also contains one of the most impressive guitar solo of all time, the “Flight of the Wounded Bumblebee” inspired by Nikolai Rimsky-Korsakov’s “Flight of the Bumblebee.” Extreme released another two albums and broke up in 1996 when Bettencourt left to follow a solo career. The band reformed in 2007 with the exception of Paul Geary and releases another album “Saudades de Rock” in 2008. Nuno Bettencourt entered an endorsement contract with Washburn Guitars in 1990 that lead to the design of Nuno Bettencourt very own signature guitar line The N-Series Guitars. Models from the N-Series Guitar line include The N5 and N6 and the famous N4 which is still used by the artist. Nuno Bettencourt continues to be active in the music industry. One of his most recent collaborations was with Rihanna on her new album “Anti” in 2016. He has earlier worked with Rihanna on two of her albums; “Loud” in 2010 and “Talk that talk” in 2011. Along the way, after Extreme band broke up, Bettencourt form and founded four different bands including The Mourning Widows, Population 1, DramaGods, and The Satellite Party. He has writing and recording engagements with a lot of artists including Janet Jackson, Toni Braxton, Joe Jonas, Steel Panther, Rihanna, and numerous others. Nuno Bettencourt also joined Yngwie Malmsteen, Steve Vai, Zakk Wylde, and others for the Generation Axe Tour which toured in the spring of 2016. Nuno continues to be one of the top guitarists in rock today. All That Shreds List of the Top Ten Female Shredders! Is Spotify Short Changing Artists While Keeping Most Of The Profits? Does Live Nation Have A Monopoly On The Concert Industry? Metal’s Best: Top 30 Guitarists Ruling the Genre!